Staining a deck is the best way to protect it while keeping its natural beauty. If you have a deck then it is important that you keep the surface safe. One way to keep the surface safe is with painting. However, paint covers up the natural appearance of the deck. If you want to protect your deck while also keeping a natural look then deck staining is what you need. The experts at MDF Painting & Power Washing are here to help. Our experienced team can thoroughly clean a variety of deck types and then seal and stain it. With our team on the job, you can count on your deck being well cared for. Contact us today online or call 1-844-257-4559 to schedule your free estimate in Greenwich, Stamford, Norwalk, & nearby in Connecticut! #2 Pressure Treated Pine. This is the most common type of decking and one we are quite experienced with. We always work around your needs whether performing just a light cleaning of the surface or a more in-depth cleaning in preparation of a stain. Composite Decking like Trex and Azek. We offer solutions that are safe for all composite-style decking so that you can be assured that no harm will be done to the look or the integrity of the material. Cedar, Mahogany, & other exotic woods. Exotic woods can be more difficult to treat due to their sensitivity. However, our team has the experience and knowledge to carefully clean and stain these woods without applying too much pressure and damaging the wood. The wood porch has been stained. Get a free estimate for your deck staining today! Do you want to keep the natural beauty of your deck while still protecting it? 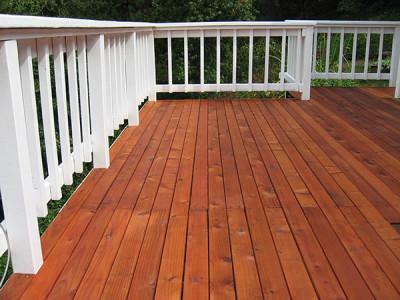 The deck experts at MDF Painting & Power Washing can provide the deck staining that you need. Give us a call at 1-844-257-4559 or contact us online today and schedule your free estimate in Greenwich, Stamford, Norwalk, Westport, Fairfield, Darien, New Canaan, Trumbull, Milford, Wilton, and nearby Connecticut!